You’re kicking back at a BBQ enjoying leisurely time with friends and family. Your mind jolts into high gear and your heart pounds as you think about your busy and stressful summer: studying for the OAT, shadowing optometrists, trying to get your OptomCAS application submitted. What? Not much?!? Is that what you want your uncle to think, that you have nothing on your plate—no plan? I didn’t think so. What you need is a better reply to that question—a question that deep down is a question about your entire future. Who knows, your uncle could turn out to be on your support team. Do you really want him to think you’ve done “not much” all summer? You’re probably thinking, “Gee, if I actually told him the truth about what my summer was like, I wouldn’t want to sound like I was complaining or bragging .” I’ll agree with that logic. So how do you effectively respond? What would be an ideal response to your uncle’s question? 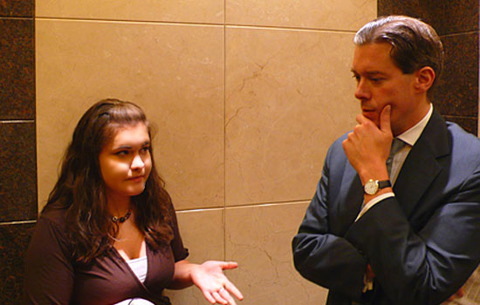 The elevator pitch is a time-honored technique traditionally used in the business world by company representatives to promote their enterprises. When I attended my own orientation for grad school and heard a PhD candidate explain how the technique could be used by a grad school student to promote him or herself, I had an “Aha Moment!” I needed to teach this technique to pre-optometry students as a way to promote themselves through the many stages of the admissions process. From answering questions posed by family members to the all-important ones asked by interviewing admissions officers, the elevator pitch will 1) help you clarify your professional goals in your own mind, and 2) to assist you in effectively conveying them to those who will be part of the process and therefore, instrumental to your success. 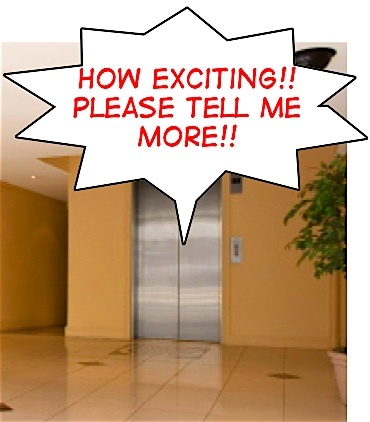 An elevator pitch is a concise, carefully planned, and well-practiced description. It should be simple, compelling, and delivered in the time it takes to ride up an elevator—hence the name “elevator pitch.” It should comfortably, confidently, and reflexively roll off your tongue without a hint of bragging. Composing the elevator pitch is way too important to take casually—it must be composed mindfully, to capture your listener’s attention quickly, and hold it until the end. Business people, visionaries, and charismatic people know the value of such a tool to captivate interest and communicate common vision. Considering the investment made in a grad school education, in a manner of thinking, serious students are small businesses themselves so why shouldn’t they use the same tool when communicating their hopes and dreams for their futures? I love this idea. Be the star of your own movie! Imagine how a serious student would play that part? What would be his or her motivation for dramatizing that specific role? How about dialogue? For proper development, spend time either in your imagination or journaling. Key ingredients will be marketing your movie and writing the dialogue—that’s where the elevator pitch comes in. Define who you are: write one sentence about who you are. Describe what you do: write one or two sentences that describe your life as a student at your current undergrad or grad program. Think about why you chose this path for your life—in your case, optometry. Why did you choose to pursue your studies at SCCO? Write one or two sentences that invite your listener into what is unique about the experience you have chosen. State what you plan/hope to do with your education: write one sentence about your hope/plan for the future. In a paragraph, bring together what you have drafted in the previous steps. Proofread and edit adding transitions, checking for dynamic language, make it more concise where possible…etc. Refine your draft until you can communicate these things about yourself conversationally. Put some energy into it! Be dynamic. You want to communicate passion and excitement. You want to invite your listener to get excited about your goals and interests. Think of crafting the beginning of this speech as you would approach writing a paragraph. In your “topic sentence” you want to draw your listener in so that they will be eager to hear more. You are going for concise and dynamic, so think carefully about the language you choose. Use action words and avoid jargon. This is something you will want to be able to memorize and be able to deliver naturally (as if you have not crafted and memorized it). You will want to have the ability to change parts of this speech so that you can have different versions for different contexts (at conferences, in the community, interviews…etc). Know who you are—ask yourself key questions to do some soul-searching before you proceed. Practice your timing and delivery—there is nothing worse than that frozen-with-panic face you’ll make when you lose your place and flub your lines. Keep it fresh—you change with each passing day so make sure your elevator pitch reflects those changes. Also, your pitch will change depending on the circumstances: job interview, applicant interview, networking, meeting new people, casual versus formal…etc. Always be prepared. I’ll add that you should proactively look for the right opening to deliver your pitch. For more examples of an elevator pitch, there’s a wide variety. Google the topic for examples. YouTube has many uploads on the topic. Next time your uncle gives you that all-important opening to deliver your elevator pitch, don’t disappoint! I guarantee, should your parents be in earshot, they will beam with pride. Star in your own movie and remember, optometry school is just one in a series of many sequels to come—sounds like you are going to need more elevator pitches! One of the most important messages you will convey on during your interview is that you have the motivation to get through optometry school. Do it with your elevator pitch! Franklin, DeVon and Tim Vandehey, Produced by Faith : Enjoy Real Success without Losing Your True Self. Nashville, Tenn.: Howard Books, 2011.